Shibe Park was built in 1909 for a Philadelphia A’s team that at the time was one of the premiere teams in baseball. Things seemed to be going well as they were champions in 1910, ’11, and ’13, but owner Connie Mack was always struggling to keep the team afloat financially and had to sell off most of its talent just to make ends meet. The team did rise again in 1929 and ’30, but most years in between and after the team seemed to struggle on and off the field. When nearby city neighbors the Phillies asked if they could share the stadium so both could save a little on their rent the A’s were happy to take them in. Both teams didn’t make much noise until new ownership came in and bought the Phils in the 1940’s and in 1950 led by Robin Roberts and Richie Ashburn they won the pennant and went to the World Series. Philadelphia became the Phillies town as thier games filled up while the seats remained empty for the A’s. The Shibe park scoreboard at the time was still its original, it had a clock at the top, large block capital letters, used large rectangular numbered cards to display scores from around the leagues. 1950 was the year the Yankees replaced their card style scoreboard with one of the first electronic ones of its kind to be used. Bright digital numbers, controlled by a remote panel so the scores didn’t have to be manually changed, bright lighting so it could be clearly seen at night, the scoreboard was a complete change in score presentation. The unpopular A’s left Philly for Kansas City before the 1955 season and sold Shibe Park which had been renamed to Connie Mack Stadium in honor of the A’s owner, to the Phillies who decided to make some improvements. The biggest one was the installation of an electronic scoreboard of their own and placed it in the right field wall for the 1956 season. But the question is where did this scoreboard come from? Well, according to at least five books and a variety of websites, including the Philadelphia Historical Society and Wikipedia, the Phillies got this new scoreboard from the New York Yankees who had just bought a new one of their own. In Movin’ On Up Robert Gordon and Tom Burgoyne explain that the gigantic device was trucked down from New York to Philadelphia to be installed. In Phillies Past and Present Rich Westcott jokes that the old Yankees scoreboard probably needed a break from all those Yankee pennants and was happy to get a rest in Philly. In Baseball Parks Tom Owens suggests that the choice of a used scoreboard instead of a new one was a sign that Shibe was already on the decline, and in the Ultimate Baseball Road Trip Joshua Pahigian and Kevin O’Connell joke that the hand me down scoreboard could be considered an early form of profit sharing. The Philadelpia Inquirer did a story on the scoreboard trade in 2009 when the Yanks and Phils met in the World Series in 2009, joking that taking Bobby Abreu from them was not the biggest thing the Yanks did for the Phils. Well, there is one big problem with all these articles and stories, they are wrong. 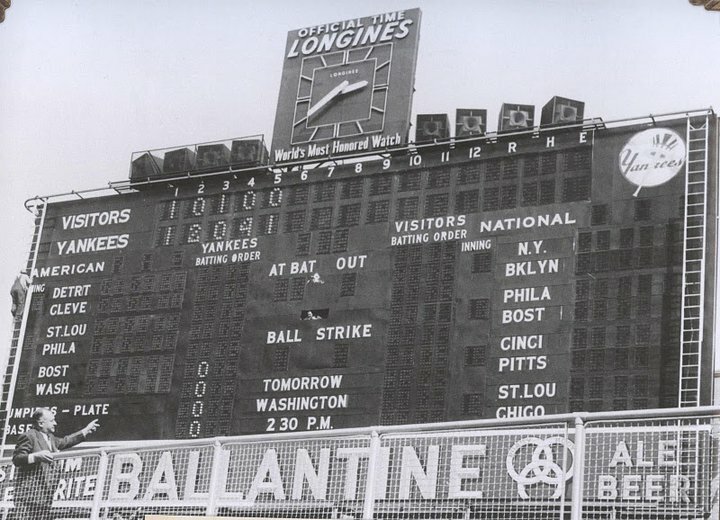 Yes the Phillies did install a new scoreboard in 1956, and yes it did look a lot like the one the Yankees had at the time, and yes it had a Ballantine ad on it, but NO it did not come from the Yankees and it was never trucked down to the city of brotherly love. The Yankees did not get a new scoreboard in ’56. The Phillies got their scoreboard, new, in 1956 from All American Scoreboards, the same Pardeevile WI based company that the Yankees did in 1950.
appeared in various newspapers throughout the country in March 1956 with no mention of them getting it from the Yankees. One article did mention that the new scoreboard in Shibe would be identical to the one in Yankee stadium. Perhaps someone though that ‘identical’ means ripped right out of the wall and taken from where it was. If you compare the Yankee stadium scoreboard of the early 50’s to the one put in Connie Mack stadium in 1956 you can see that they are not the same. Yankee stadium had its Ballantine ad at the bottom, Connie Mack at the top. Yankee stadium went to twelve innings, Connie Mack only to ten. Also, you can compare Yankee stadium scoreboards before and after 1956 and see that they are exactly the same, (although in 1959 the Yanks did get a new scoreboard) . Writing a book is a vast undertaking, and many facts have to be researched and covered by the authors. If I ever write a book myself I’m sure someone will find factual errors in mine, but today, I think I found a factual error in theirs. Nice article and impressive research, Todd. Thanks Jeff, truth is I just like looking at pictures of old scoreboards. Did someone purchase the scoreboard when Connie Mack Stadium was raized, if so who? Nice article but there is one error. The newspaper is The Philadelphia Inquirer, not Enquirer.